Starwood has a new rate promotion for stays in Florida until September 30 2013, for 500 bonus Starpoints per stay for booking a special rate code. You can access this offer on Starwood’s website here. The minimum stay for this rate usually starts at 2 nights and may include some extras such as parking and internet. The rate code this offer is LYPKG. I have not checked the extras that regular rates at this property include, but inclusions with this “Viva” rate are clearly spelled out. 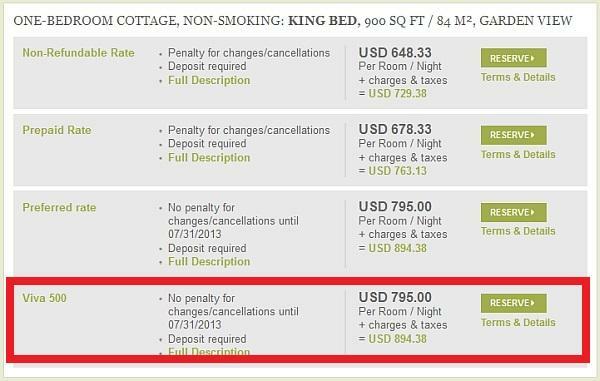 The “VIVA 500” rate is $150 more expensive per night compared to the lowest prepaid rate. Just note that the included $75 daily resort credit that is included with this rate plan. Just make sure that you don’t overvalue the 500 Starpoints that this rate plans gives you in addition to the possible premiums. The value of 500 Starpoints is maybe $10. Offer is valid at participating Starwood Hotels & Resorts, please see participating property list. Offer is valid for stays through September 30, 2013. Previous articleQatar Airways To Join Oneworld In October?